Is China Buying the World?, by Peter Nolan, Polity Press, €19.90, $17.95. China has become the world’s second biggest economy and its largest exporter, and is now getting close to becoming the foremost importer as well. It possesses the world’s largest foreign exchange reserves and has 29 companies in the FT 500 list of the world’s largest companies. It is now competing to become the most prolific generator of new patents. China’s ‘rise’ is preoccupying the world. 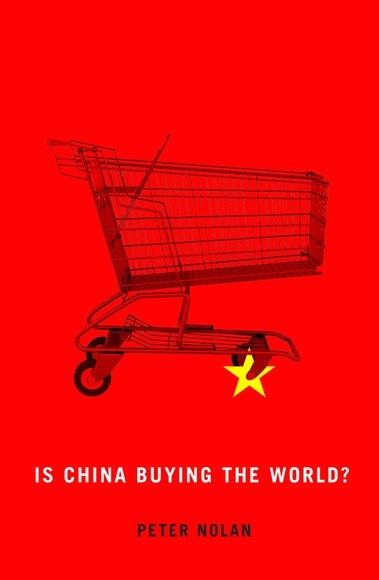 In this short book, Peter Nolan – one of the leading international experts on China and the global economy – probes behind the media rhetoric and contests the idea that China is buying the world. Since the 1970s the global business revolution has resulted in an unprecedented degree of industrial concentration. Giant firms from high-income countries with leading technologies and brands have greatly increased their investments in developing countries, with China at the forefront. Multinational companies account for over two-thirds of China’s high technology output and over 90 percent of its high technology exports. Global firms are pressing China hard to be permitted to increase their presence without restraints. Not an easy task. In contrast, Chinese firms have a negligible presence in the high-income countries – in other words, Nolan thinks that we are “inside them” but they are not yet “inside us.” China’s seventyodd ‘national champion’ firms are protected by the government through state ownership and other support measures. They are in industries such as banking, metals, mining, oil, power, construction, transport, and telecommunications, which tend to make use of high technology products rather than producing these items themselves. Their growth has been based on the rapidly expanding home market. China has been unsuccessful, so far, in its efforts to nurture a group of globally competitive firms with leading global technologies and brands. Whether it will be successful in the future is an open question. The same question applies to its rising currency. Nolan’s book is a balanced and very honest analysis. Looking at things from a distant perspective, he may be missing one point: the situation must be appreciated not only in terms of ownership or rankings as of today, but also in terms of dynamics and time-scale. In China, the short term is a 100 year period, whereas most of our politicians look at their watches every minute, anticipating the next election, and our business execs get stressed about the next quarterly report. So far, China is doing much better than Russia, its neighboring oil-rich country, which is having trouble transforming its black gold into social advantage and improvement. China is betting on almost every piece of technology, know-how and land, in order to move forward, and, in many ways, its ability to make tough decisions for the long term is already placing it ahead of many developed countries. China may not buy the present world, but its future…? That’s for sure.